protests escalating across Iran, the issue of this regime’s opposition and alternative has understandably transformed into a highly sensitive political subject. Despite all the claims and disputes, we are witnessing Iranian regime Supreme Leader Ali Khamenei and a long list of Iranian regime officials signaling the very source of their main concerns. In their remarks one can conclude that from the Iranian regime’s perspective, the subject of its alternative is crystal clear. With the fast expansion of the ongoing protests against the Iranian Regime, many of its officials are pointing their fingers at the People’s Mujahedin Organization of Iran (PMOI/MEK). Case in point, Iran’s current Minister of Defence and Brigadier General, Amir Hatami: “Since 1981, our enemies have been making every attempt to create a rift between us and people, and ultimately to put an end to our government’s existence” (News of the Islamic Revolutionary Guards Corps [IRGC], 4 August 2018). Workers of the Ahavaz National Industrial Steel Group continuing their strike & protest. TheyChanting: We Persist, We Will Die but Will Retake Our Rights. Despite heavy presence of security forces, the people of Marivan, Kurdistan, gathered for the funeral of six people who had died in yesterday’s incidents and staged demonstrations against the government. On Tuesday, truck drivers in Mashhad and Shapur, Isfahan, went on strike in protest to high prices, low income, lack of access to spare parts, and the government’s inefficiency in addressing their demands. Numerous cities across Iran reported a variety of protests on Tuesday as the growing trend continues to concern the mullahs’ regime. On Sunday night, a large number of people in Marivan, Kurdistan, gathered in front of the mayor’s office in protest to the lack of collection of garbage around the city, which has resulted in the propagation of bad smell in different parts of the city. The protesters dumped the garbage in front of the municipality and set them on fire to show their protest. Anti-riot police launched an attack at 11 am Sunday morning targeting a protest strike held by around 500 employees of the Haft-Tappeh Sugar Cane Company in Khuzestan Province, southwest Iran. Dozens of people on Saturday, August 18, gathered in front of the Parliament in Tehran to protest and express their anger at the disgraceful and scandalous cheap selling out of one of the most important and iconic natural resources in Iran, The Caspian Sea. Locals of the Zoviyeh district in Ahvaz, southwest Iran, clashed with municipality authorities who intended to destroy their homes. Azadi Stadium, Tehran On Friday evening a football/soccer match between the teams of Tehran Persepolis and Masjed Suleiman Naft (Oil) in the capital’s Azadi Stadium became the scene of an anti-regime protest. At a press briefing in Paris on Thursday, representatives of the National Council of Resistance of Iran provided detailed information about Iranian protests that have continued for eight months in spite of intense repression. The briefing was held on the closing day of an exhibition marking the 30th anniversary of the massacre of 30,000 Iranian political prisoners in the summer of 1988. Store makers in the religious city of Mashhad shopping centers took to the streets today, protesting skyrocketing prices. The strikes and protests of the merchants of Tehran’s shoe bazaar entered their second day on Sunday. The protesters, who started their strike due to high prices and lack of access to the basic goods necessary for their line of work, chanted “Death to high prices” and “Death to the dictator,” targeting the regime in its entirety. more than 140 cities from all of Iran 31 provinces joined the strike. 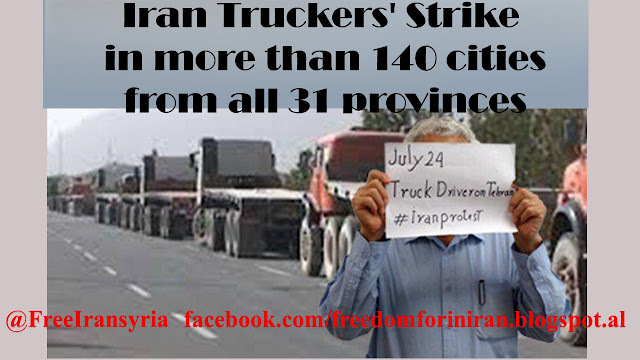 Iran truck drivers’ day 19 strike tells the regime there’s no stopping them. They managed to keep their strong strike going in May. This time they’re holding on till they have a total change. These drivers just like the brave protesters are up in different cities. Today on day 19 truck drivers from Kermanshah and Hamadan sent their video. There are mass waiting lines of cars outside the petrol stations. The second round of the truckers’ strikes began July 23. This was the start of the hottest Persian month but nevertheless, it happened. A message left on Telegram said the drivers can wash this regime away if they stand unite. Our strike is going to increase pressure on the system. Despite the Iranian regime’s efforts to quell protests and intimidate protesters and discourage them from taking to the streets to voice their demands for freedom and democracy, the brave people Iran continue to defy the regime. In recent days, rebellious units in different cities carried out activities to show their support for the PMOI/MEK and their continued opposition to the Iranian regime in its entirety. In Qazvin, one member of a rebellious unit named after MEK martyr Zohreh Ghaemi holds a poster of the recent message by resistance leader Massoud Rajavi and reiterates their resolution to keep the fire of the uprising that started in December alive. The members of a rebellious unit from Saqqez, Kurdistan, have sent a video of themselves writing “Death to Khamenei” slogans on the wall. soccer/football match between Persepolis and Esteghlal Khuzestan held in Al Qadeer Stadium of Ahvaz, southwest Iran, became the scene of this city’s brave youth clashing with the repressive state police and anti-riot units. Many of the security unit members were injured as a result. A number of the youth were also wounded and transferred to a nearby hospital. On Sunday, August 5, on the 112th anniversary of the Constitutional Revolution, despite the undeclared martial law and the heavy presence of repressive forces who had surrounded the 1st Circle of Gohardasht of Karaj, the brave youth demonstrated below the “Shohada” bridge around midnight, and by chanting “Death to the Dictator”, caught the regime by surprise. In Tehran, despite the siege of the central parts of the city, frustrated people gathered in different places. The brave youth demonstrated and chanted “Death or Freedom” on the Kargar-Jonoubi street. The repressive forces consisting of the Guards, Basijis, the riot guards and plainclothes agents brutally attacked the protesters and battered them. Demonstrations in the Park-e Shahr of Tehran led to clashes with suppressive forces. The people confronted them while chanting: Rascals, Rascals! A number of protesting girls and boys were arrested. The brave youths blocked the repressive forces by burning trash bins and tires in the Enghelab Ave.
the repressive forces arrested the youth under the false accusations of drug trafficking. The fed-up people of Kazeroun protested in the Shohada Street and Square against their dire livelihood situation and the authoritarian and corrupt regime of mullahs. They chanted: High prices and inflation, misery of the people; Death to high prices; Do not be afraid; Do not be afraid, we are all together; Honorable Iranians, support, support. In Shiraz, Mashhad and Qom, regime’s security forces surrounded the rallies in fear of spreading protests, and tried to prevent the formation of demonstration by attacking the crowd. The people of Bandar Abbas also gathered on Saturday night for the third consecutive night in protest of the high prices and economic situation in front of the Radio-Television station. They rallied at night in the central bazaar of the city. demonstration and clashes with IRGC forces in Tehran with the slogans: "Death to 40 years of slavery , We will die take back Iran and & Death to Khamenei, Death to the Dictator"
One of the most notable characteristics of the demonstrations that shook different Iranian cities in the past week was the protesters’ slogans, which quickly transformed from economic woes to calls for the overthrow of the Iranian regime and the ouster of Ali Khamenei, its supreme leader. 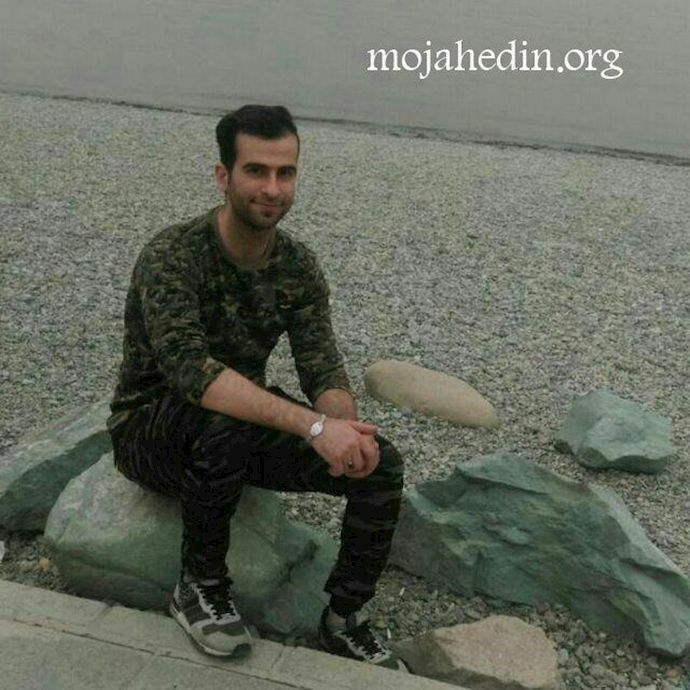 On Friday, August 3 a young man from Karaj, Reza Otadi. was shot dead by repressive forces during the demonstrations in the city, and a large number of protesters were arrested. In order to deceive the public opinion, the IRGC wrote, "The assailant fired from inside the car 206 with a non-military weapon. Earlier and in the riots of December 28, several gunmen who had group affiliations were arrested by the security forces.” This way, the IRGC tried to portray the protesters and the PMOI as those who killed Reza Otadi; a lie that does not deceive anyone. Such lies do not work anymore and the regime must be held accountable for all its killings over the past four decades. Such lies by a regime that, in spite of the Belgian and German prosecutor's and police statements and the arrest of its terrorist diplomat, attributes the terrorist plot against the Iranians gathering in Paris on June 30th to the PMOI, is quite expectable. On Friday, August 3, various cities in Iran, including Tehran, Karaj, Eshtehard, Isfahan, Ghahdariijan, Andimeshk, Mashhad, Shiraz, Hamedan, Kermanshah, etc. were host to the demonstration and expression of anger and disgust of the mullahs’ regime. The protests, which began at dusk, continued in many cities until midnight, and turned into conflicts with mercenaries and repressive forces. The repressive forces closed all the entrances leading to Gohardasht and targeted the protesters from the roofs of buildings or bridges by bullets. Furious youths clashed with the repressive forces and forced them to flee in a number of streets. They also burned the motorcycles left from those forces, and punished a plainclothes agent and several other criminal mercenaries. Passing-by vehicles at Sepah square in Karaj expressed their solidarity with the brave youths of the city by blaring their horns. Since the mercenaries were not able to confront the youth, the regime supported them with more forces from other cities. The angry youths of Ghahdarijan continued their protests on Thursday night and confronted the repressive forces’ attacks by barricading streets. They also took control over part of the streets. Bassijis and anti-riot guard mercenaries wounded a number of people by firing at them. Thursday marked the third consecutive day of protests sweeping cities across Iran. The brave young people of Ahvaz demonstrated at Naderi intersection while chanting: “Our enemy is right here; they are lying that it is America”; “The nation is poor, while the mullahs live like a god. In Tehran, the people demonstrated at Vali-e Asr Square chanting: “Death to Khamenei; Death to the Dictator; Cannon, tank, firecracker, mullahs should be killed.” They clashed with the IRGC forces who attacked them. They also set fire to trash bins on the way from Vali-e Asr toward Hossein Square in order to block the path of mercenaries. In Najaf Abad, the brave women chanted: They fed Syria, but made our youths old. The brave youths chanted against the suppressive forces: You rascals. In Shiraz, on Daryoush Street, the brave youths chanted slogans: Death to Khamenei; This month is the month of blood, the mullah is overthrown; Suppression doesn’t work; Cannon, tank, firecracker, the mullahs must get lost; Why you, the people, are sitting? Iran is like Palestine. The youth clashed with the mercenaries who had fired tear gas against them. 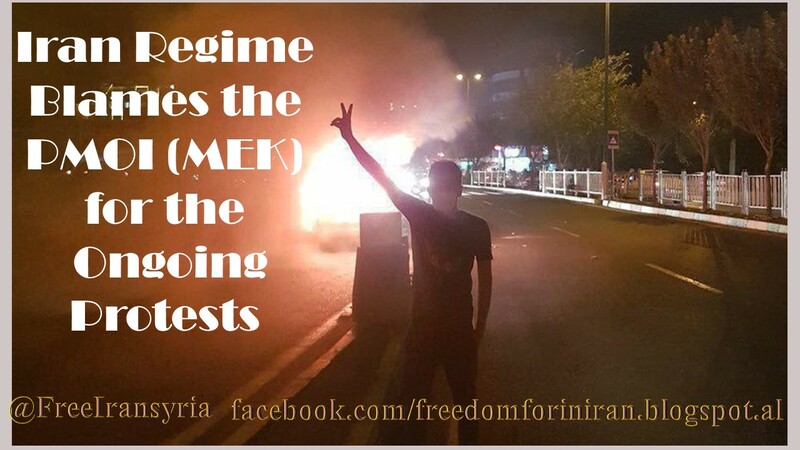 The mullahs’ regime had resorted to various tricks to prevent the protests and its spread to other cities. In fear of the outbreak of the people’s anger, mullahs’ intelligence officials desperately tried to discourage people from participating in demonstrations by sending SMS on mobile phones last night. In a statement by Khamenei's faction in Qom, the so-called "Coordinating Council of Principlists of Qom Province", warned the people not to participate in the demonstrations because the People’s Mojahedin Organization of Iran (PMOI/MEK) uses the issue of high prices and economic disturbances and directs demonstrations against the regime. Since this morning, angry protesters in various cities across the country, including Isfahan, Mashhad, Shiraz, Najaf Abad and Shahin Shahr, demonstrated against the tyranny of the mullahs’ regime, chanting slogans such as: Death to the Dictator. It was at a time when the repressive forces were on full alert from the first hours of the morning to prevent the formation of these protests, but they failed. The Internet connections have slowed down in many parts of the country. Protests that started on Tuesday in different cities of Iran over high prices and economic woes entered their third day on Thursday. In Shapour, Isfahan, where protests have been raging for the past two days, demonstrators are chanting, “Don’t be afraid, we’re all together.” A large contingent of anti-riot police have surrounded the area. The demonstrators have also set vehicle tires ablaze to prevent the regime’s repressive forces from attacking and dispersing them with tear gas. Second day of the uprising in Isfahan, chants of death to the dictator, Khamenei, shame on you! Leave the country! The riot guards and other repressive forces attacked the demonstrators and sought to disperse people by firing tear gas. Young people confronted the suppressive forces and burnt tires to neutralize the tear gas. In some streets, repressive forces inevitably retreated. Mrs. Maryam Rajavi, President-elect of the Iranian Resistance, hailed the brave people of Isfahan and their courageous uprising against the tyranny of the mullahs, and said: “The brave and proud young people who are struggling with the tear gas and brutality of oppressive forces in New Shapour, are the messengers of the freedom of the homeland from the clutches of a brutal regime that has occupied Iran in the name of religion”. She called the public, especially the youth, to support the uprisers in Isfahan, Karaj and Shiraz. People, especially the youth of Karaj, northwest of Tehran are pouring into the streets again on Wednesday, August 1st to demonstrate. The protesters are chanting 'death to the dictator' and 'Guns Tanks, fireworks, the mullahs must get lost.' The protest is ongoing as this report is being prepared. Sunday marked the 14th day of truck driver's strike in dozens of major cities in Iran. These cities include, Tabriz, Maragheh, Urumieh, Isfahan, Zarrin-shahr, Najaf-Abad, Shahr-e Kord, Lordegan, Farrokh-shahr, Jajarm, Ahvaz, Khorram-shahr, Behbahan, Mamasani, marvdahst, Zarghan, Kerman, Kermanshah, Yasouj, Gargan, Khorram-Abad, Chaloos, Saveh, Arak, Bandar-Abbas and Yazd. 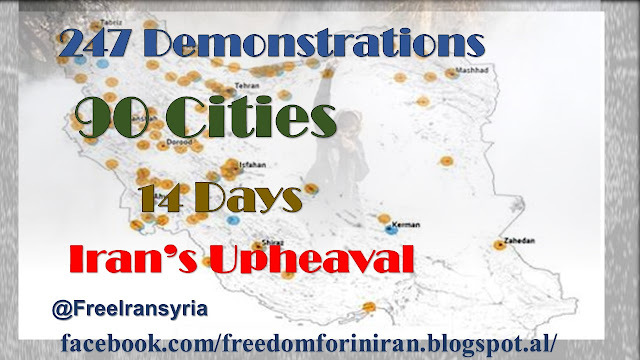 Last week more than 140 cities from all of Iran 31 provinces joined the strike. Truck drivers began their strike on July 22 in protest to low income rates and high tariffs set by the government as well as the increasing prices of equipment and spare parts for their vehicles. Truck drivers began their strike on July 22 in protest to low income rates and high tariffs set by the government as well as the increasing prices of equipment and spare parts for their vehicles.